This article originally appeared on the website of InsightCrime on April 26. A self-defense group operating in a rural community of El Salvador is asking for formal legal recognition, a reminder of security concerns elsewhere in the region caused by similar non-state actors taking justice into their own hands. The group, based in the town of San Nicolás Lempa in the department of San Vicente, is made up of about 60 citizens. The group's members are seeking legal recognition in order to be able to operate openly and to gain access to more arms and equipment, La Prensa Gráfica reported. The origins of the self-defense group date back to 2015, when former combatants from the country's 1979-1992 civil war rearmed themselves following the appearance of Barrio 18 members in the community and the assassination of a community leader and his daughter, presumably by the gang. The fact that there is an enormous backlog in US immigration courts is well known. The backlog has prompted the Trump administration to promise to hire many new immigration judges and to speed up the process. What is less well known is that Salvadorans make up an increasingly large percentage of the open cases in immigration court. Using data through March 2017 from the TRAC database at Syracuse University, there were a total of 572,608 open deportation proceedings in immigration court and 123,036 of these cases involved Salvadorans (21.5%). Only Mexico had more of its nationals in deportation proceedings with 128,659. The image at the top of this blog is a mural by Salvadoran painter Antonio Bonilla which is located in the Guzman Anthropology museum in San Salvador. The mural is entitled 200 años de lucha por la emancipación en El Salvador (2011) (200 years of struggle for the emancipation of El Salvador) and was commissioned by then president Mauricio Funes for the 200th anniversary of the independence of Central America from Spain. Bonilla's works are intensely political, commenting on the social reality of the country. The paintings can be satirical and ironic with a rejection of the official telling of Salvadoran history. The street gang Mara Salvatrucha or MS-13 is US president Donald Trump's rhetorical ISIS for the Americas. Trump uses the spectre of MS-13 gang violence to generate fear of every migrant from a region just as he uses the spectre of ISIS to generate fear of Muslims and migrants from the Middle East. Trump and his attorney general Jeff Sessions have frequently referred to the Central American gang as the reason the US must build a southern border wall and must increase immigration enforcement and deportations. The new brand strategy is based on a previous study conducted by the El Salvador Government and further research carried out by Interbrand. It looks to “put El Salvador on the map as one of the new destinations and growing global economies,” says Interbrand. A new visual identity also aims to increase international awareness of El Salvador and promote investment, exports and tourism in the country. The logo centres on the letter “V” within El Salvador’s name and sees a “kaleidoscope” of colourful graphic icons related to the country – including a volcano, birds and waves – bursting out of it. The logo also includes a tagline beneath the country’s name that reads: “Great like our people”. When the gold mining company OceanaGold lost its international arbitration with the government of El Salvador, it was ordered to pay $8 million in legal fees incurred by El Salvador to defend the case. Yet so far, the company has not honored its obligation to pay those fees. Good data is important to good understanding for policy decisions, and this is especially true when it comes to understanding migrant and refugee flows across borders. My go-to source for documented and credible migration data is the Migration Policy Institute ("MPI"). The MPI report provides a wealth of other statistics which you can sort and filter on such things as education level, age, workforce participation, healthcare coverage, English language proficiency and more. Bookmark the MPI site for when you need migration data in the future. Apprehensions of undocumented migrants at the southwest US border have dropped dramatically since president Trump has taken office. Apprehensions have dropped from 58,000 in December to 43,000 in January, 24,000 in February and 17,000 in March. El Salvador's military denied today that it has improperly destroyed documents relating to war crimes during El Salvador's bloody civil war. Last week the Institute for Access to Public Information (IAIP) reported that it had asked the attorney general to investigate whether the defense ministry and the national archive had destroyed military files from the war. The specific documents in question deal with a massacre in the cantón San Francisco Angulo in Tecoluca, San Vicente, on July 25, 1981. IAIP says the documents were destroyed sometime in 2015 or 2016. Commenting on the matter, the Secretary of Participation, Transparency and Anti-corruption, indicated that it was an ongoing problem that Salvadoran government officials did not preserve documents, and that such a practice had to be changed in order to improve transparency. A swarm of small earthquakes has hit the greater San Salvador area in the past 48 hours causing nervousness among the population. The Civil Protection agency has issued a yellow alert at a national level in order to facilitate inter-agency cooperation. Authorities have urged calm and stressed that the series of quakes does not make a major earthquake more or less likely. 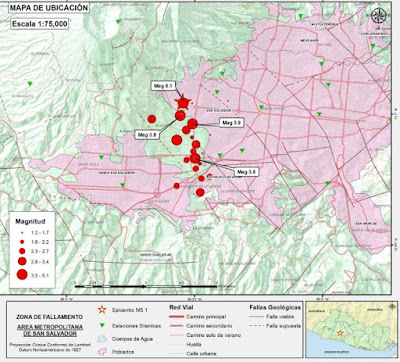 The population was urged to review its earthquake readiness, just as residents should be prepared at all times in earthquake prone El Salvador. The Ministry of the Environment (MARN) warns that the seismic swarm could last a number of days or even weeks. Through 8:45PM San Salvador time on Monday there had been 147 quakes of which the largest measured 5.1 on the richter scale. MARN explains that this seismic swarm is a product of one of the active faults which run through El Salvador. This particular fault runs just south of the capital city. 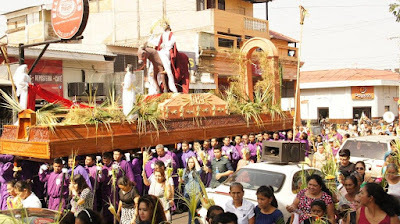 Sunday was Palm Sunday or Día de los Ramos, and in El Salvador the Catholic faithful filled the streets and churches with colorful celebrations of the start to Holy Week. The message was slipped under the door of their tiny home during the night. Leave the community where they lived for years within 48 hours. The note did not spell out what would happen if the family did not leave. It wasn't necessary. Too many people had been killed in their community already. The family grabbed their belongings and left under cover of darkness. Another family to add to the total of those forcibly displaced by gang violence in El Salvador. On Tuesday this week, law enforcement in El Salvador arrested José Adán Salazar Umaña known as "El Chepe Diablo" the reputed leader of the Texis Cartel in El Salvador. For a number of years, a court in Spain has had before it a case involving the 1989 murder of the Jesuit priests at the University of Central America. Although the case is before the court, none of the former military officer defendants are before the court. El Salvador's Supreme Court has twice denied extradition of the officers who are in the country. That leaves Inocente Orlando Montano Morales, a former colonel in the Salvadoran army who is in custody in the US, and who has a pending extradition order to Spain. But so far, Montano's lawyers have managed to prevent that order from taking effect. Most recently, Montano's lawyers filed a habeas corpus action in federal court in North Carolina to stop the extradition. The US government moved to dismiss the petition, but in an order issued last week, the federal judge refused to dismiss the petition and ordered more briefing from the parties and further delaying the process. If you want careful observations of Salvadoran life from the perspective of a North American who spends lots of time in the country, read Linda's El Salvador Blog. Her most recent post includes a series of photos of daily life she recently took out of car windows while travelling around the country. Off of a dirt road in a very rural area, this family raises a few animals. Notice the yellow pig shelter. If you remember the old pay phones that used to take prepaid phone cards back in the '90's - then you remember those old yellow phone booths. Yup, apparently they make great pig shelters. Salvadorans are experts at recycling things. See the rest of Linda's post titled Just Click! And Keep Your Phone in Your Lap. Yesterday Nayib Bukele used the medium of Facebook Live to announce that he would seek reelection as mayor of San Salvador as a candidate for the FMLN. Wearing a baseball cap backwards on his head, seated in his home office with two electric guitars leaning on the wall behind him, Bukele explained the factors he had to weigh before deciding to run for mayor. Claiming that he had only made up his mind to run on Sunday, Bukele stated that he could not walk away and allow ARENA to undo what he had accomplished in the capital city. The FMLN has already stated that it will back Bukele for a second term, despite the independent track which Bukele keeps apart from his party. You can watch his announcement here. Currently the leading candidate from ARENA appears to be Norman Quijano. 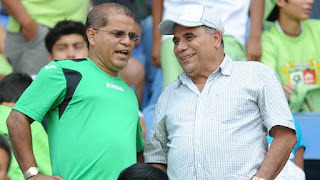 Quijano was the mayor of San Salvador from 2012-2015, and unsuccessfully ran for president in 2014 against Salvador Sanchez Ceren. The FMLN has long had ties with the government of Venezuela. FMLN leaders regularly travel to Venezuela. Venezuela sends subsidized petroleum products to FMLN controlled municipalities. FMLN has also regularly joined Venezuela in denouncing perceived US interference in Venezuela. You can get a sense of the relationship in this article from Diario CoLatino from 2015 "El Salvador and Venezuela, a historic friendship against imperialist interference" (in Spanish). Venezuela today is in economic and political crisis. The oil rich country is having troubles feeding its people; political dissent is often repressed; crime rates rival El Salvador's.